Sony Pictures have been the victim this past month of a massive cyber-hack that has resulted in leaked movies, e-mails, embarrassing documents and more. All of which culminated yesterday with terroristic threats from those who claim to be behind the attack. The hackers, who call themselves “The Guardians of Peace”, threatened action against movie theatres that planned to show the upcoming movie ‘The Interview‘ – a comedy starring James Franco and Seth Rogan who are tasked with assassinating the dictator of North Korea; Kim-Jong Un. Shortly after this disheartening announcement, Sony also stated that they “have no further plans” to release the film, whether it be a home media release of VoD, presumably because the hackers could easily compromise the networks of any company that digitally distributed the movie such as Amazon or Netflix. This is a sad day for Hollywood and creative expression in general. I’m certain that Sony Pictures knew they were going to garner controversy and ill-will towards the movie (they greenlit, produced and filmed a movie about the assassination of Kim-Jong Un after all), but they probably didn’t expect legitimate terrorist threats. Even if the threats didn’t materialise as a 9/11 style catastrophe, because of the huge hack on the company this past month, it’s clear that “The Guardians of Peace” have the resources behind them to make good on any threat they make. It’s for that reason I implore people to not call Sony or the theatre-chains that pulled the movie initially “cowards”. I’m not saying that you should agree with their decision (I, for the record, do not think the movie should have been pulled, because if you pull one movie due to threats of violence then where is the line drawn?) but I don’t think it’s cowardly to try and keep your employees and customers safe at the movies from a threat that has been made by an organisation with a proven track-record. Sony have invested upwards of $80 million on ‘The Interview‘ including marketing and distribution so they won’t have made this decision likely, but they could have lost no matter what they did. If, god forbid, something did happen and these threats weren’t heeded then Sony would be blamed for not pulling the movie and the company would undoubtedly implode amid the backlash. Before you decry the company as “cowards”, take into account the magnitude of their decision. This isn’t a simple flick of the switch for them. 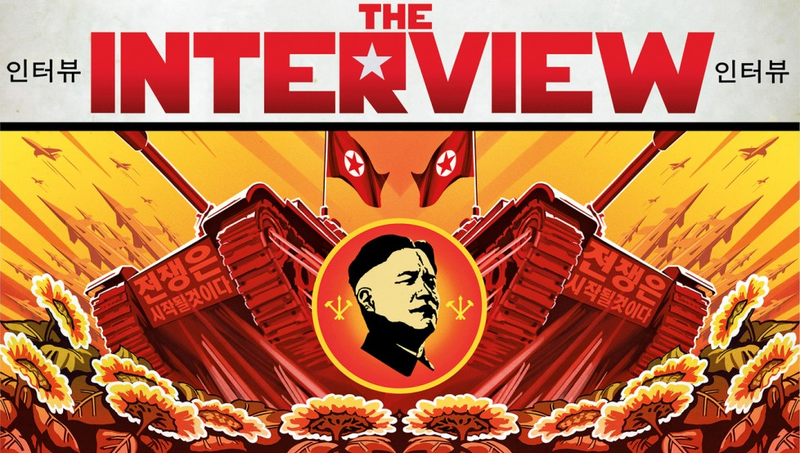 What’s ironic is that if North Korea are behind these threats due to the depiction of their leader in ‘The Interview‘, their concerns may be misplaced as early reviews are saying that the actor who plays Kim-Jong Un in the movie (Randall Park) is the best thing about the film and they’ve turned him into a likeable and endearing character as far as oppressive dictators are concerned. It’s not all doom and gloom though. 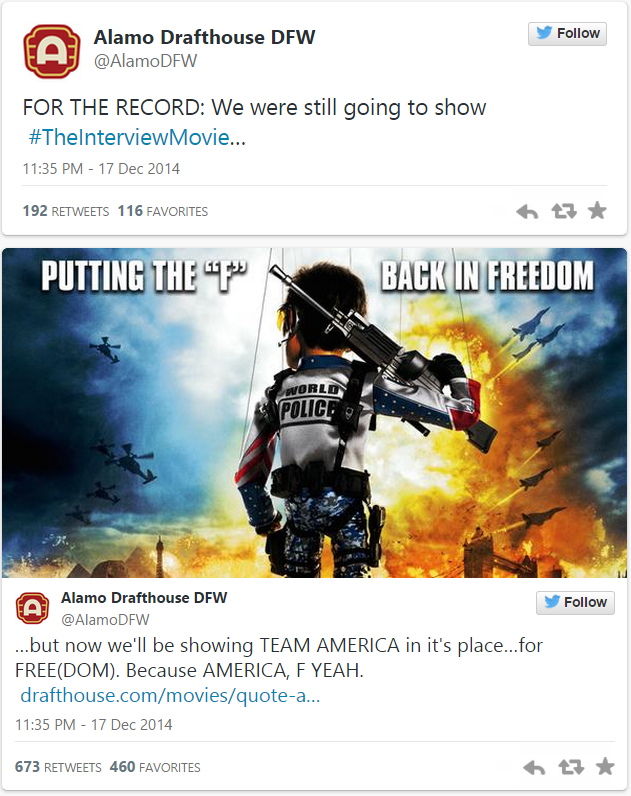 The Alamo Draft House theatre in Dallas Texas announced that while they won’t be screening ‘The Interview‘, they’ll be replacing the showings with 2004’s ‘Team America: World Police‘ and you’ll be able to get a ticket for free(dom). A part of me wishes that North Korea were more interested in Sony making good Spider-Man movies. If that was the case, the rebooted franchise would have turned out very differently. But all (partial) joking aside, today is the day that the bad guys won. Where threats and abuse beat freedom of expression. Hopefully Sony will change their minds or find some way to recoup their losses and release the film in some capacity and that somehow, the industry will prove to North Korea that they can’t bully other countries into conforming to their horrible, oppressive regimes. ‘The Interview‘ will NOT be released in the US on December 25th 2015.